TBS has developed a unique TV card represents that easiest way of equipping a PC with no fewer than four DVB S2/S satellite tuners. 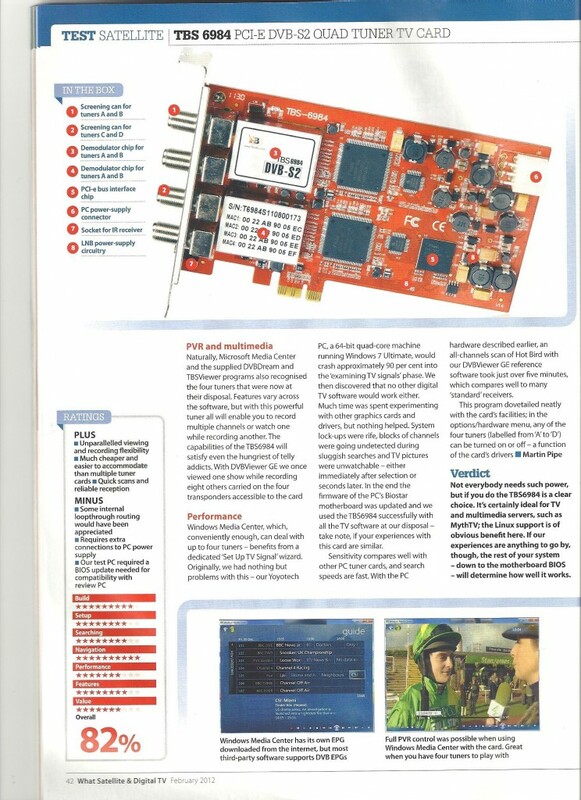 The new TBS6984 quad tuner card was reviewed in the latest issue of What Satellite (a professional and authoritative satellite magazine from UK) and received a Silver award from review ranking! Thanks to Martin Pipe, the author of this review. We really appreciate your contribution and Professional evaluation. Now we would like to share this great review with you! Digital TV tuner cards facilitate the monitoring of TV or radio programmers on your computer desktop. They’ll also turn a computer into a PVR-bitstreams plucked out of the ether can, after all, just as easily be written to a file for future playback as passed to decoder software for live viewing. If your computer is networked, then other connected devices around the home, like multimedia players, Can access these files. With appropriate software and configuration they can be streamed to private locations across the internet too. 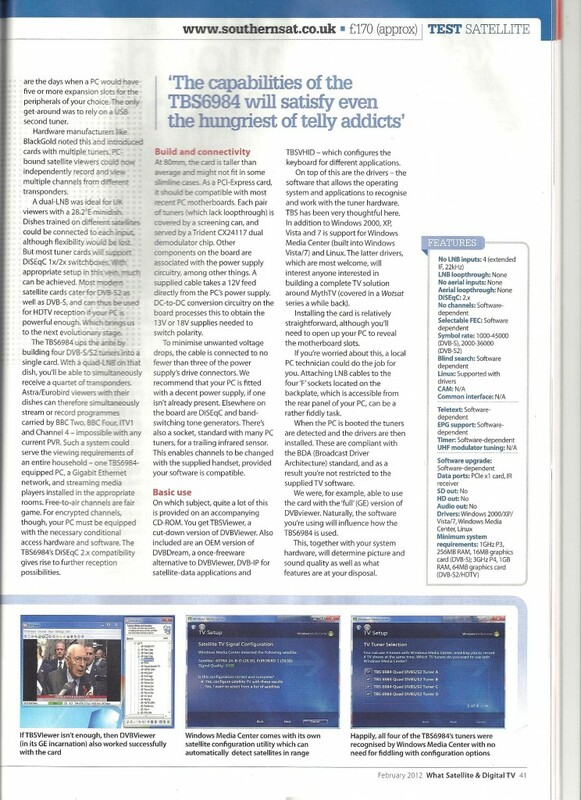 Only now are commercial PVR manufactures like TiVo waking up to such flexible possibilities-those with tuner cards fitted to their PC’s have enjoyed their benefits for years. The first TV tuner cards had only one tuner, this restricted you to one channel at a time, although some software (such as DVBViewer) lets you simultaneously watch and record channels carried by the same transponder. If you wanted channels on different transponders-e.g BBC Two and Channel 4.-It was neccessory to install a pair of tuners, the problem with modern PCs is restricted expansion potential; gone are the days when a PC would have five and more expansion slots for the peripherals of your choice. The only get-around was to reply on a USB second tuner. Hardware manufacturers like BlackGold noted this and introduced TV cards with multiple tuners. PC bound satellite viewers could now independently record and view multiple channels form different transponders. A dual LNB was ideal for UK viewers with a 28.2°E minidish. Dishes trained on different satellites could be connected to each input, although flexibility would be lost. But most tuner cards will support Diseqc 1x/2x switchboxes. With appropriate setup in this vein, much can be achieved. Most modern satellite cards cater for DVB S2 as well as DVB S2, and can thus be used for HDTV reception if your PC is powerful enough, which brings us to the next evolutionary stage. 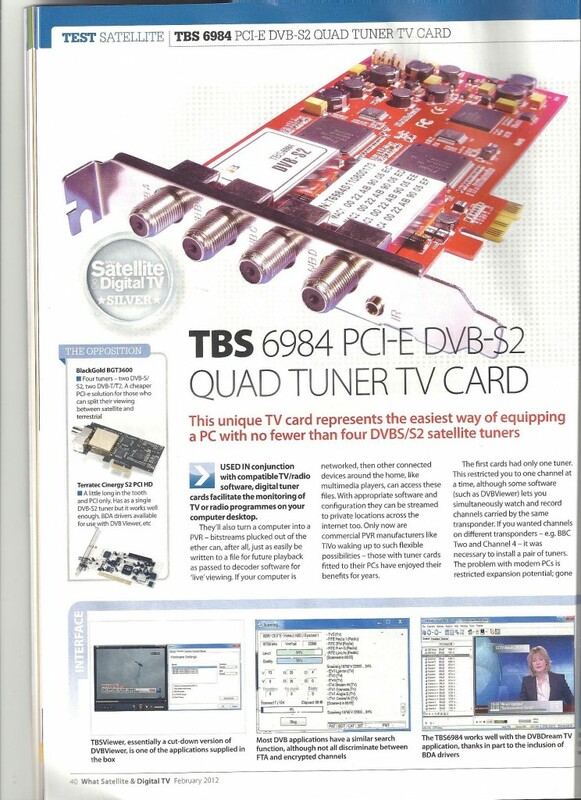 The TBS6984 PCIE DVB S2 Quad TV tuner card ups the ante by building four DVB S/S2 tuners into a single card. With a quad LNB on that dish, you will able to simultaneously receive a quartet of transponders, Astra/Eurobird viewers with their dishes can therefore simultaneously stream or record programs carried by BBC Two, BBC Four, ITV1 and Channel 4. Impossible with any current PVR, such a system could serve the viewing requirement of an entire viewing requirement of an entire household- one TBS6984 equipped PC, a Gigabit Ethernet network, and streaming media players installed in the appropriate rooms, Free-to-air (FTA) channels are fair game. For encrypted channels, though, you PC must be equipped with the necessary conditional access hardware and software (TBS5980 or TBS69828 DVB S2 CI Card with CAM can do it). TBS6984’s DiSEqc2x compatibility gives rise to further reception possibilities. At 80mm. this card is taller than average and might not fit in some slimline cases, As a PCI express card, it should be compatible with most recent PC motherboards, Each pair of tuners (which lack loopthrough) is covered by a screening scan, and severed by a Trident CX24117 dual demodulator chip. Other components on the board are associated with the power supply circuitry, among other things. A supplied cable takes a 12V feed directly from PC’s power supply. DC-to DC conversion circuitry on the board processes this to obtain the 13V or 18V supplies needed to switch polarity. To minimise unwanted voltage drops, the cable is connected to no fewer than three of the power supply\s drive connectors. We recommend that your PC is fitted with a decent power supply. if one isn’t already present. Elsewhere on the board are DiSEqc and band switching tone generators, There’s also a socket , standard with many PC tuners, for a trailing infrared sensor, This enables channels to be changed with the supplied handset, provided your software is compatible. On which subject, quite a lot of this is provide on an accompanying CD-ROM. You get TBSViewer(a cut-down version of DVBViewer), an OEM version of DVBDream(an alternative to DVBViewer) and TBSVHID(which maps handset buttons to the appropriate keyboard for different applications). Installing the card is relatively straightforward, although you’ll need to open up your PC to reveal the motherboard slots.If you’re worried about this, a local PC technician could do the job for you. Attaching LNB cables to the four sockets located on the backplate, which is accessible from the rear panel of your PC, can be a rather fiddly task. When the PC is booted the tuners are detected and the drivers are then installed, These are compliant with the BDA(Broadcast Driver Architecture）standard, and as a result you’re not restricted to the supplied TV software.We were, for example, able to use TBS6984 with full (GE) version of DVBViewer. Naturally, the software you are using will influence how the TBS6984 is used.This, together with your system hardware, will determine picture and sound quality as well as what features are your disposal. Window Media Center, which conveniently enough, can deal with up to four tuners-benifits from a delicated “Set UP TV signal” wizard. Originally, we had nothing but problems with this, – out Yoyotech PC, a 64 bit quad-core machine running Windows 7 Ultimate. Would crash approximately 90 per cent into the examining TV signals phase. We then discovered that no other digital TV software would work either. In the end the firmware of the PC’s Biostar motherboard was updated and we used the TBS6984 successfully with all the TV software. Sensitivity compares will with other PC tuner cards, and search speeds are fast. With the PC hardware described earlier, an all-channels scan of Hot Bird with our DVBViewer GE reference software took just over five minutes, which compares well to many standard receivers. This program dovetailed neatly with the card’s facilities, in the options/hardware menu, any of the four tuners (labeled from A TO D) can be turned on or off- a function of the card’s drivers. Not everybody needs such power, but if you do the TBS6984 is a clear choice, It’s certainly ideal for TV a multimedia servers, such as MythTV, the Linux support is of obvious benefit here. It is also ideal for IPTV provider for commercial use.